When I was working on the cookbook Eating It Up in Eden, I sorted through more than 200 contributed family-favorite recipes. Somewhat to my (pleased) surprise, there were very few offerings that duplicated one another–but another surprise was that one of those few duplicated recipes was a dish unfamiliar to me: creamed potatoes and peas (pages 42-43). The recipes varied slightly, but the essence was fresh peas, small new potatoes, a basic white sauce, and a hefty infusion of springtime dairy products. On a family farm, this was a dish that absolutely depended on seasonality: there’s only a short window for peas overlapping with new potatoes, and springtime brings more and better milk for the butter and cream. I recently acquired two real photo postcards that tie right into those creamed peas and potatoes. Both were taken by an amateur photographer who printed them up on postcard stock. 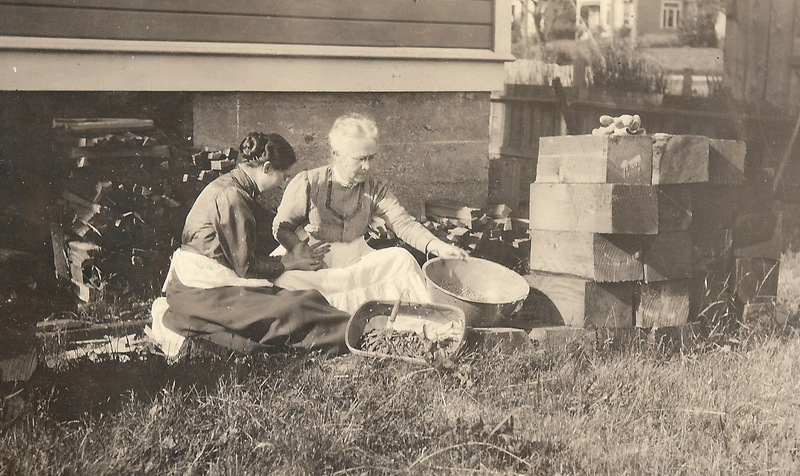 The view of two women shelling peas was mailed from Astoria June 28, 1912, to Mrs. F. M. Merwin of Portland, from Harry. “It has been raining all day. It is bad enough when the sun shines which is seldom”: this indeed describes Astoria. I infer from other clues that Mrs. Merwin is Harry’s mother, and that the women are Mrs. Merwin and her mother; so the location of the photo is, very likely, Portland. (N.B. this photo was also used as an illustration in Eating It Up in Eden). The other postcard view is unlabeled and unused, but it was acquired from the same source and it dates from the same period; are these the same two women? Drinking warm milk direct from the source was once a savored treat (though when I was a kid and my Uncle Ted offered me a slurp, I thought it was plum awful). 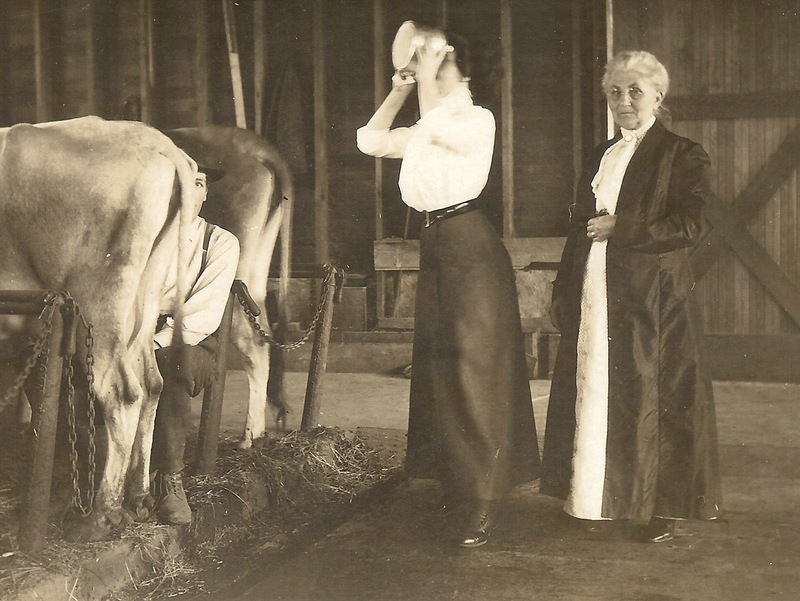 We don’t know the story of why these two well-dressed women are in the barn, or who or where they are, or who the fellow is lurking behind the cow’s tail. But we can know that the year is about 1912 or so, and that the milk is fresh and good. Here’s a slightly edited version of the recipe that was contributed by Mapril Easton Combs for creamed potatoes and cream. Mapril lived and cooked and ate (and still does) on the Oregon Century Farm that was established in 1898 by Robert and Emma Easton near the Coos County community of Dora, about 18 miles east of Myrtle Point along the East Fork Coquille River. Scrub skins off new potatoes and boil spuds until done. Cook peas in a little water until just done. Drain potatoes, add to peas, but don’t drain peas. Mix a couple of tablespoons of flour into cold milk or cream to make a thin paste, add a little hot water from the peas and stir. Add flour mixture gradually to peas and potatoes; stir to thicken. Add milk or cream until it looks right; add salt and pepper to taste. Add butter just before serving. If too thin, make up a little more flour paste and add gradually. This is really good if made with thick cream and lots of butter. Addendum: A quick perusal of the 1912 Polk directory for Portland shows the residents of the household of Mrs. F. M. Merwin were Frederick M. Merwin, harness maker and head of the household; Mary E., a clerk for Clarke, Woodward Drug. Co., Harry E., an electrician, and Wyman W., a telegraph operator. Lucy J. Merwin, widow of William A. and a dressmaker, lived less than a mile away. N.B. : in the summer of 1912, Clarke, Woodward opened their new offices in the Woodlark Building, still standing at SW Alder and Park and designed by Doyle, Patterson & Beach. The firm, dating from 1865, was “the first to carry dental, surgical, and photographic supplies in the Northwest,” according to an article in the Oregonian, June 2, 1912. Amateur photographers were good customers of Clarke, Woodward.